Typically we view tree removal as a last resort. Sometimes there are options for tree preservation & tree protection that can be explored before making a final decision on the future of your trees. With that being said, often times, there is no other option than complete tree removal. If the tree poses a threat to other trees and plants from disease, etc. Full Circle Tree & Shrub is equipped to remove large, hazardous trees, from your property while maintaining a safe work environment and fair prices. Always respectful of delicate structures, landscapes and lawns, it is our goal to leave your yard more beautiful than it was before we came. 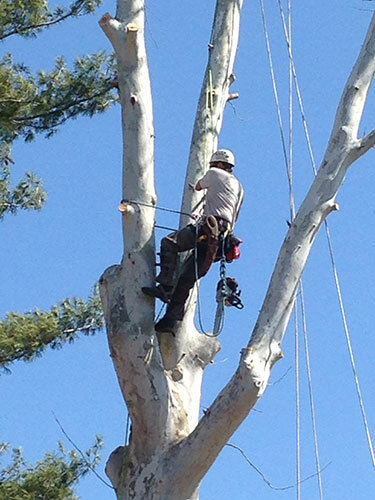 We climb & rig most trees for removal and use our bucket truck only when necessary for our safety or in cases where it will save time (and save you money). We take these extra measures to help preserve your yard and landscaping and for the safety of everyone involved. The FCTS crew will remove wood, brush and debris incidental to the work, and all of this clean-up is included in the estimate cost, unless otherwise noted on the estimate. We also offer stump grinding services. We are licensed and insured for our protection and yours.